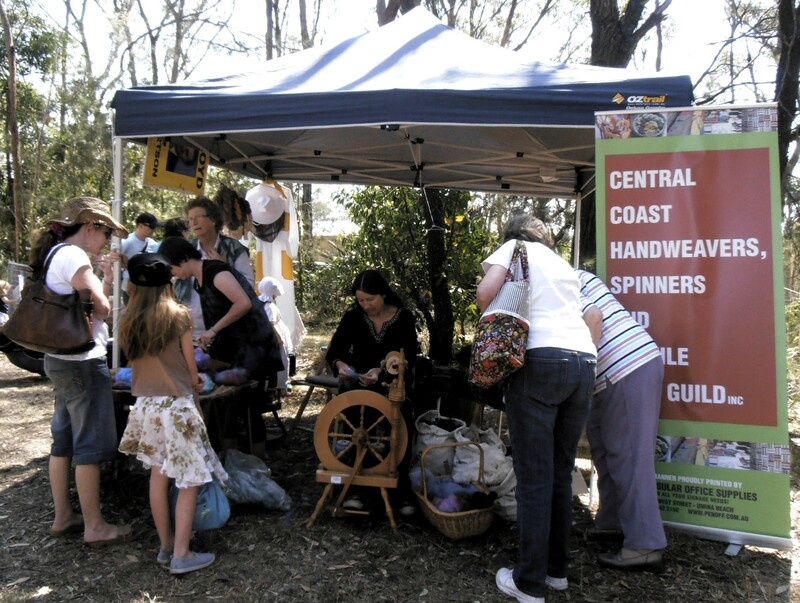 The Central Coast Handweavers, Spinners and Textile Arts Guild were proud to demonstrate their skills at the 50th Mangrove Mountain Country Fair (19th of October 2013). 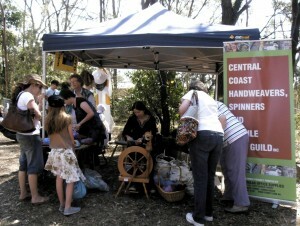 “The Fair” as its known to locals is one of the longest continually running events in NSW operated by a rural community, for the benefit of the local community in. 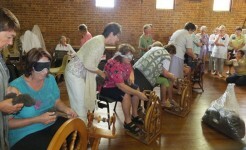 Guild members Bev Smith, her daughter Naomi and Naomi’s family kept their wheels and carders at full pace all day as visitors stopped by to learn about the Guild’s crafts and watch wool and alpaca fleece be turned into beautiful yarn. The younger visitors to the fair were particularly interested – perhaps some of them think yarns are something Grandpa tells and clothes come just from the shops. 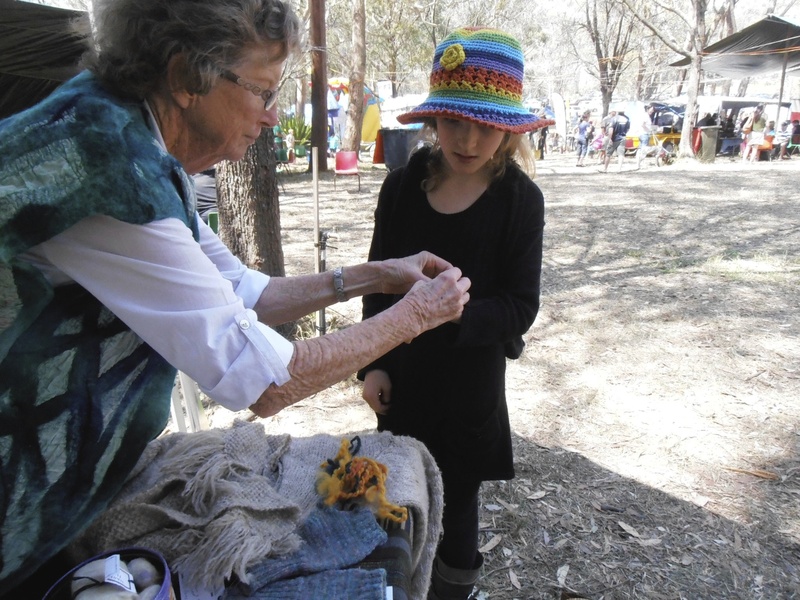 Guild members have again been asked to set up and weave their magic at the 2014 Country Fair, and we hope to see you there! 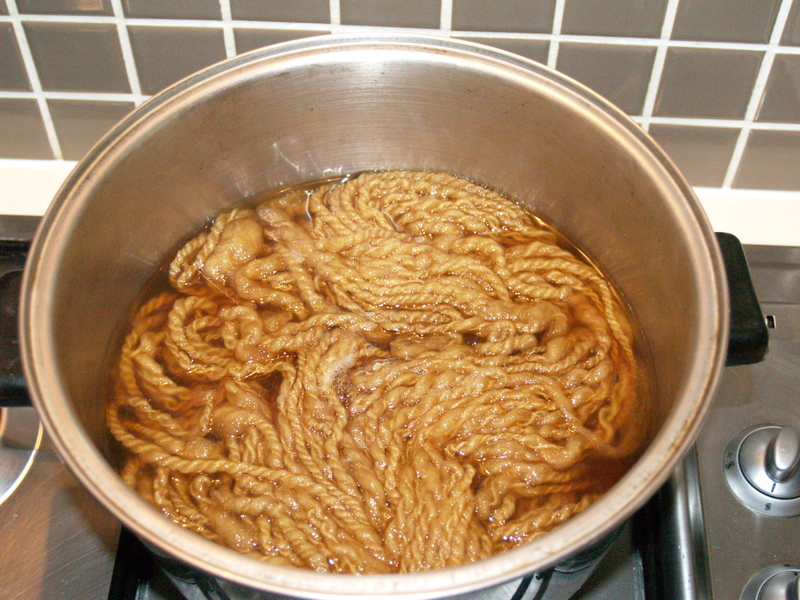 I really enjoy dyeing wool. I love seeing how the colours will turn out. It’s always a surprise. 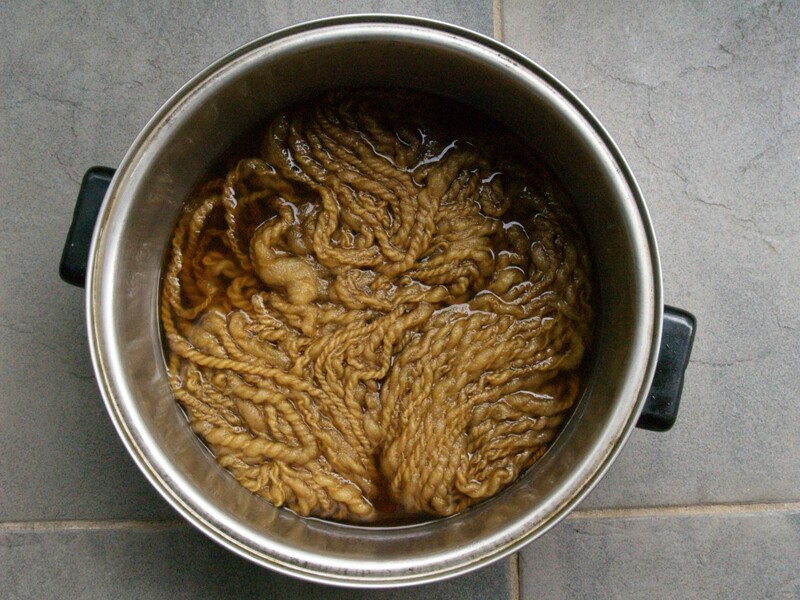 I quite like the idea of using natural dyes, but have always been put off by the toxic mordants, or fixing compounds, required by many of the plant based dyes. Early one summer, Olive came in to the cottage with a handful of Coreopsis flowers and mentioned that they were great for dyeing AND that they required no mordant. Perfect! 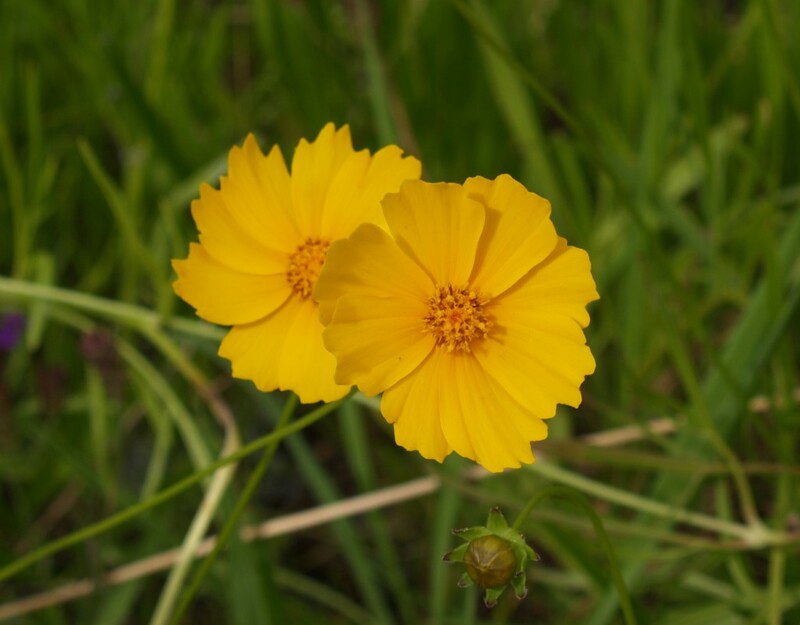 So off I go to pick a large amount of lovely bright yellow Coreopsis flowers for my dyeing project. I read somewhere that you need at least a 1:1 ratio of fibre to flowers, and possibly even more, so I used a 50g skein of natural wool that I had already handspun, and weighed 50g of flower heads. I placed my flowers in a saucepan and covered them with water. Vicki had told me that I should really do this outside, as you can really stink up your kitchen and it’s also possible that some of the plants are toxic, so I would never dye inside if I was remotely unsure about the safety of the plant. I had no idea what the smell would be like, but threw caution to the wind and fired up the stove top. Once the concoction was boiling, I took a few careful sniffs and breathed a sigh of relief at the absence of a foul scent. The smell was a little strong, but the exhaust fan stopped it reaching any further than the kitchen. 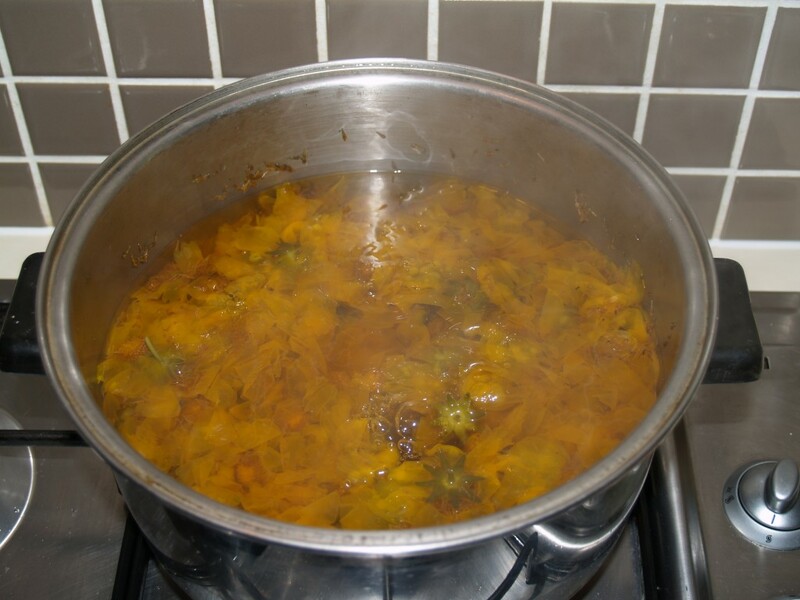 I let the flowers simmer for an hour, then let my flower stew sit until it cooled to let the maximum amount of colour infuse into the dye mix. Once cooled, I strained the flowers out and added the wool. On to simmer again for another hour. Regular checking is required of course to make sure that there is enough liquid. After the hour is up, I put my pan outside to cool. The pan was left outside overnight to soak up as much dye as possible. I liked the look of the colour thus far. I was cautiously optimistic that this would turn out well, and that the colour would not fade too much during rinsing. I took the plunge and rinsed my skein with cool water until no more dye came out, and laid it out to dry in a shady spot with good air flow. Hooray. I was very pleased with the result. Now what to do with it… by Naomi. Here are some of the lovely balls of wool that were handspun by our Tuesday group using the wool that we all prepared together last month. 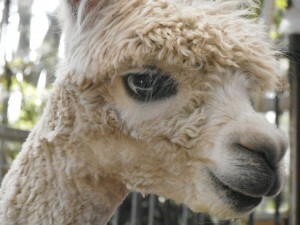 Every now and then we spend a day preparing some fibre to make some art yarn together. 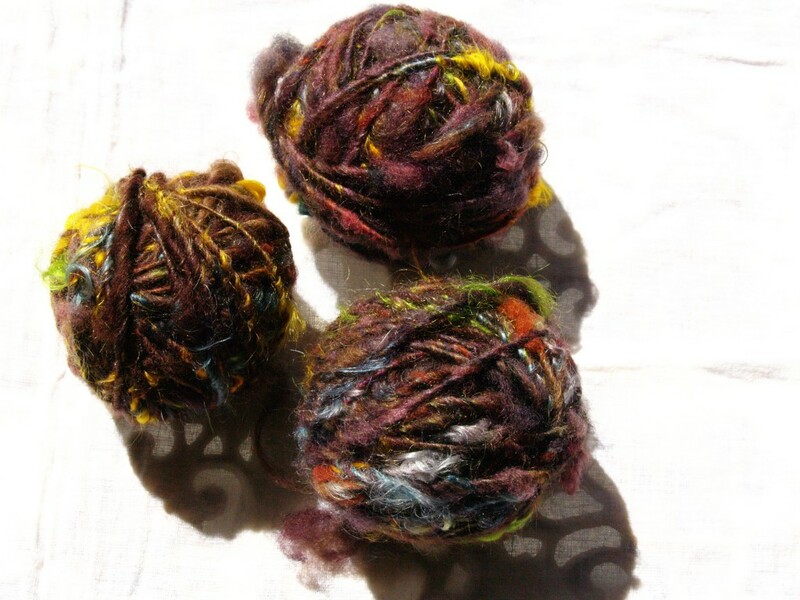 We decide upon a theme for the colours, then go through the fibre stash to see what we have in complementary colours that match our chosen theme. This time, there was some wool that we had prepared on a previous dyeing day, some natural brown wool, and a multitude of small amounts of wool, alpaca and mohair, some bright and some not. 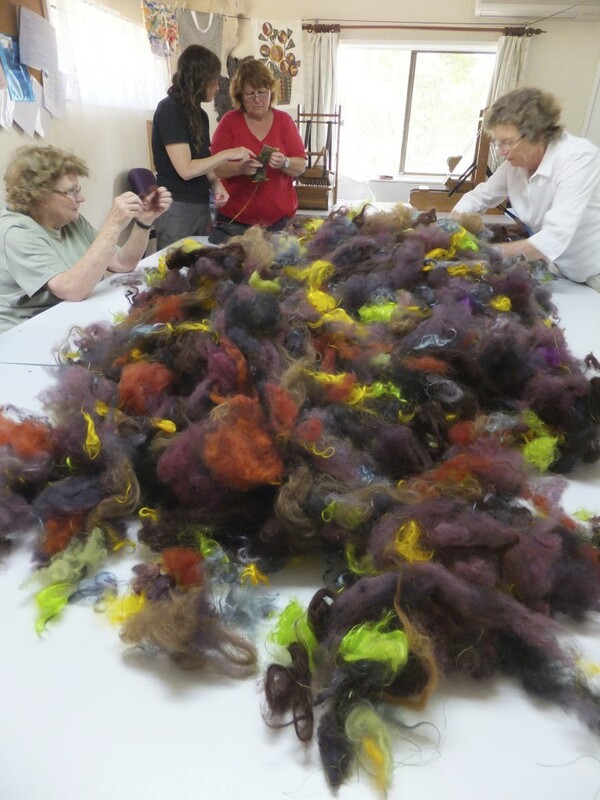 We toss all the fibre together on a large table, everyone grabbing handfuls to pull apart to get all the different colours and fibres mixed together. 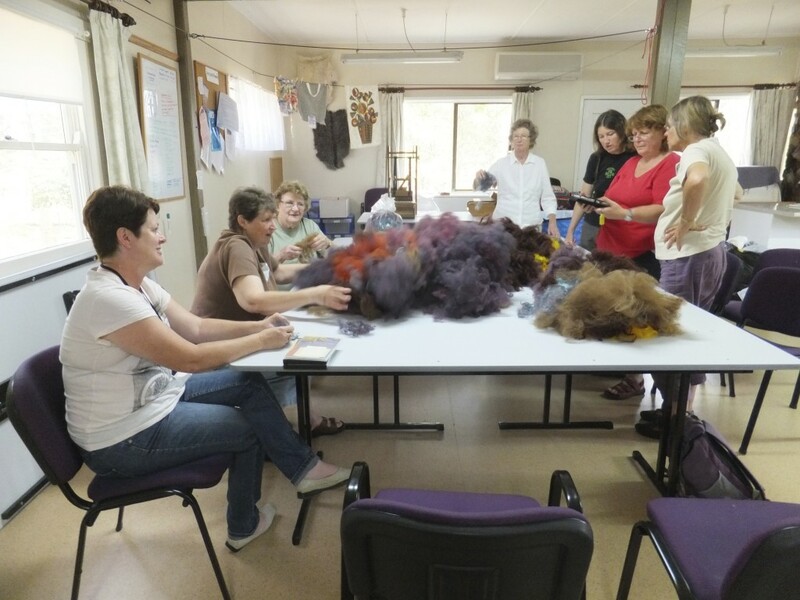 There’s always lots of friendly chatter during this part of the process, with wool jumping around the table and alpaca fibres floating up our noses. Next we use the picker to separate all the fibres and get some air into the mix. There is less chatter during this part of the process because nobody wants to get their fingers caught in the picker! 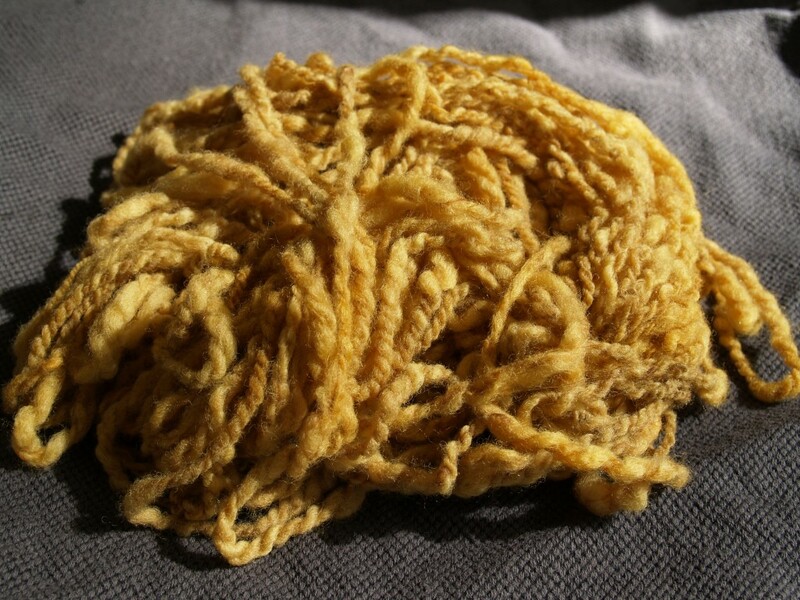 Once all the fibre is done we take a bagful each and spin chunky singles, then a couple of us normally volunteer to ply with something suitably fine, and voila! 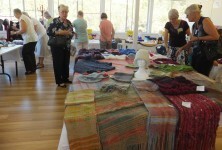 We have some gorgeous art yarn to sell at our next exhibition.